In cooperation with Big House Books, Katharine Todd’s classes are collecting books for inmates in Mississippi correctional facilities, both juvenile and adult. Dr. Todd will be sponsoring a book club this year to give students the opportunity to support Big House Books and raise awareness of its mission. 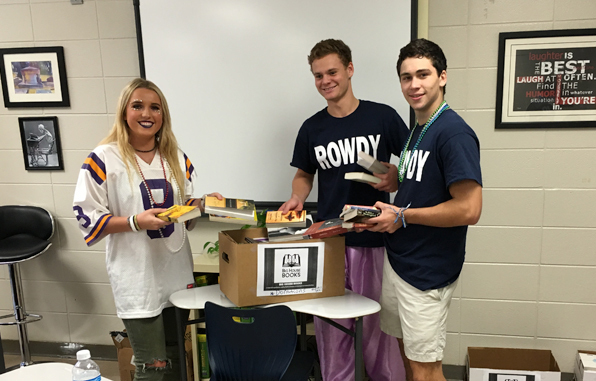 So far, students have collected three large boxes of books just through Dr. Todd’s classes, prior to the book club’s first meeting. “I just recently found out about Big House Books–actually last weekend at the MS Book Fair–and was very moved by the letters they had on display from inmates who are benefiting from their program. I mentioned it to my classes this week, and I already have two and a half copy paper boxes filled with paperbacks,” said Dr. Todd. The new club will sponsor packages for the inmates and have a book packing party for them this year. The club will collect books throughout the year. “I’m hoping that this will allow students a ‘re-homing’ option for paperbacks that they read during the summer and school year but do not want to keep. I’ll have more details once the club gets up and running,” she said. For more about Big House Books visit bighousebooksms.org.